The signing ceremony for the International Agreement on a Unified Patent Court took place at 3:15 p.m. on 19 February 2013. The scene in the Council Room at the Justus Lipsius Building in Brussels was a strange one: all the Member States of the European Union present except Spain. 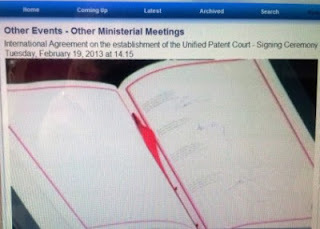 Twenty-four of them – all but Bulgaria and Poland, present but not signatories – had just concluded an international agreement to establish a Unified Patent Court outside the institutional framework of the EU. There were just three authentic texts, in German, French, and English, all together in a single volume. Starting with Belgium, one by one they affixed their signatures in the presence of the cameras under the Irish Presidency, with Commissioner Barnier as Master of Ceremonies. Spain's absence had been announced, as had Italy's presence, Italy having decided to sign the Agreement even though it had not joined the enhanced cooperation procedure that had ushered in unitary protection for EU patents for the other 25 EU Member States. 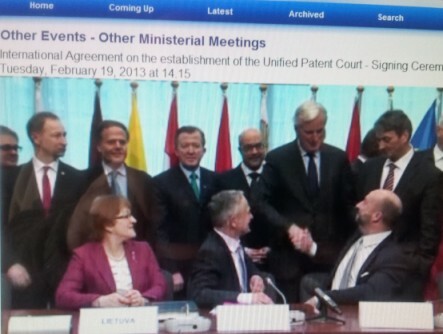 Thus, in Italy, the Agreement will apply only to traditional European patents validated in that country. The countdown to entry into force of the Agreement now begins. This will also imply application of the two Regulations adopted in December of last year (Regulation (EU) No. 1257/2012 ofthe European Parliament and of the Council of 17 December 2012 implementingenhanced cooperation in the area of the creation of unitary patent protection and Council Regulation (EU) No. 1260/2012 of 17 December 2012 implementingenhanced cooperation in the area of the creation of unitary patent protectionwith regard to the applicable translation arrangements). The Agreement will enter into force on the first day of the fourth month after deposit of the 13th instrument of ratification or accession by the States, provided that these 13 States include France, Germany, and the United Kingdom, unless that date falls in 2013, in which case the Agreement will enter into force on 1 January 2014. Heavy pressure will doubtless be brought to bear on all signatory States to deposit their instruments of ratification by 1 November 2013, which would result in the Agreement's entering into force on 1 April 2014. The Friends of the Presidency Group (Patents) is to meet in Brussels on Friday, 27 February, with a packed agenda including a review of each State's plans for ratification and an initial exchange of views on setting up the Administrative, Budget, and Advisory Committees. The ceremony concluded with a family photo – Commissioner Barnier's priceless comment in front of the cameras, "Do you allow the Commissioner to be in the picture?" – and a speech by the President of the Council underlining "this important step towards a new architecture within the European Union". No mention of Spain's absence was made.